This website is part of a project to to investigate which neighbour cats are paying me a visit regularly. 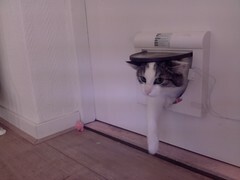 Besides my own cats I noticed that other cats occasionally enter my house through the cat door. This project and website is also partly inspired by the fascinating BBC documentary the secret life of the cat. They go a lot deeper than just a camera next to a cat door though. I am using a Raspberry Pi with a no-IR camera mounted to take a picture when the cat flap opens, either to the inside or the outside. I mounted a magnet on the flap and two reed-switches to detect movement of the flap. In the pictures you can see the switch that detects inbound traffic. The outbound traffic switch is mounted outside. The Raspberry Pi will upload all photos to a Flickr account. This site will then use the photos from the Flickr page and display them here. It displays pictures of cats taken with the Pi. It uses the NoIR camera module to be able to make better pics in the darkness. The drawback is the daytime pics have a slight red tint. Lighting is done using infrared LEDs. These LEDs are mainly used to provide a light source at night. The fact that they are infrared makes the light invisible for the human eye. Yes, many more infos here over on my main weblog.